I must say, I have really been neglecting my poor little food blog, but summer in Maine is glorious, and I don’t want to miss a second. That certainly doesn’t mean I haven’t been eating or traveling, in fact, I have been doing a ton of both! The main thing is finding a time to step out of the beautiful sunshine and into my home office…finally I have forced myself. Last weekend on a long and often tumultuous journey we called “furniture shopping” we stopped in Brunswick to check out a few shops. Nest is a particularly beautiful store, and we often love to go there and admire their furnishing and wish that we could have a home that was made entirely of custom ordered fabric couches and vintage inspired bird wall hangings, but I digress…we found out they were discontinuing the acorn fabric I so loved in the Times Square Chair so we were back out on the street, our belly’s were empty from an afternoon of defeat from all angles. We had heard there was a decent Italian restaurant in Brunswick, which we felt was laughable. I mean, we have been in Maine for a year-and-a-half without so much as a single decent Italian meal. Moving from the Pittsburgh area certainly spoiled us for Italian. I mean there it’s all french fries on sandwiches and Italian–the way Nonna made it! It was so darn tasty that I swear…I was afraid after moving here I might never taste that kind of love in a dish again. We stepped into The Great Impasta on Maine Street in the early afternoon. We were one of only three tables that were seated and I was feeling skeptical. The decor is definitely cheesy, but it had an overall cozy feel. There was one single waitress for the entire restaurant at this time. She was very attentive and came right over with menus and to take our drink order. We started with the fresh fried mozzarella. It was so delicious, cut right from a fresh block and fried to a delicious level of crispiness. It was then covered with a homemade marinara sauce, which was excellent. As you can see we devoured it before the proper photo could be taken. Next it was onto our lunch entrees. I decided to go for the special, which was linguine with white clam sauce–a dish I can NEVER turn down if I see it on a menu somewhere. 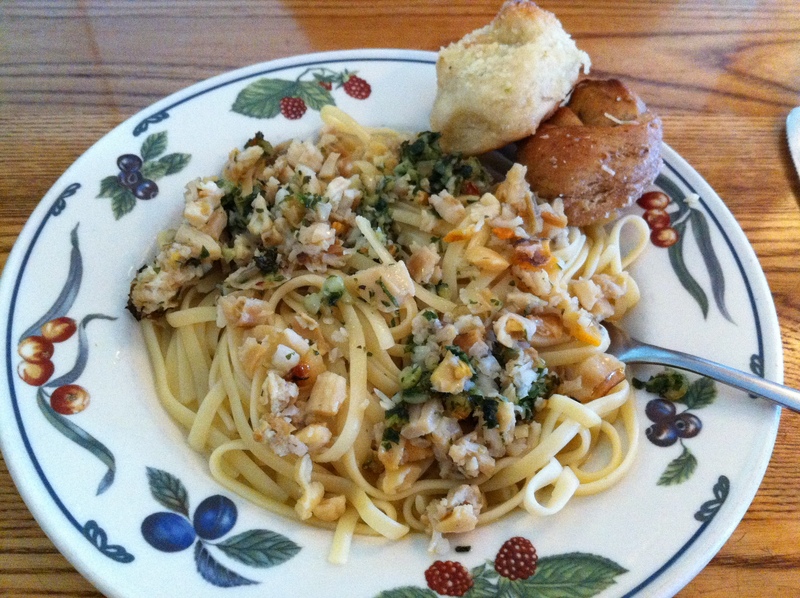 It was very nice, with lots of fresh clams, garlic and oil, but it was missing the creaminess that I am used to. I don’t think it had enough parmesan cheese or something. 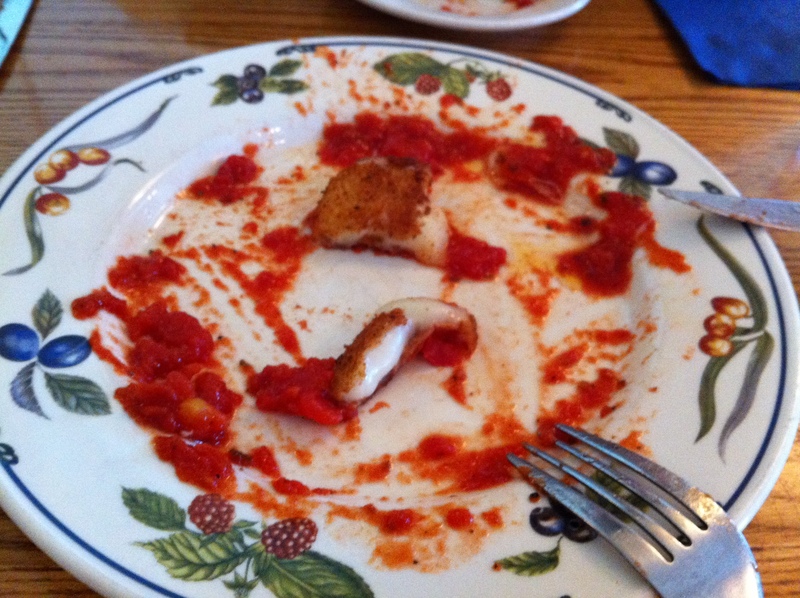 I was yearning for more, so this dish was okay, but still lacking for my high maintenance Italian taste buds. 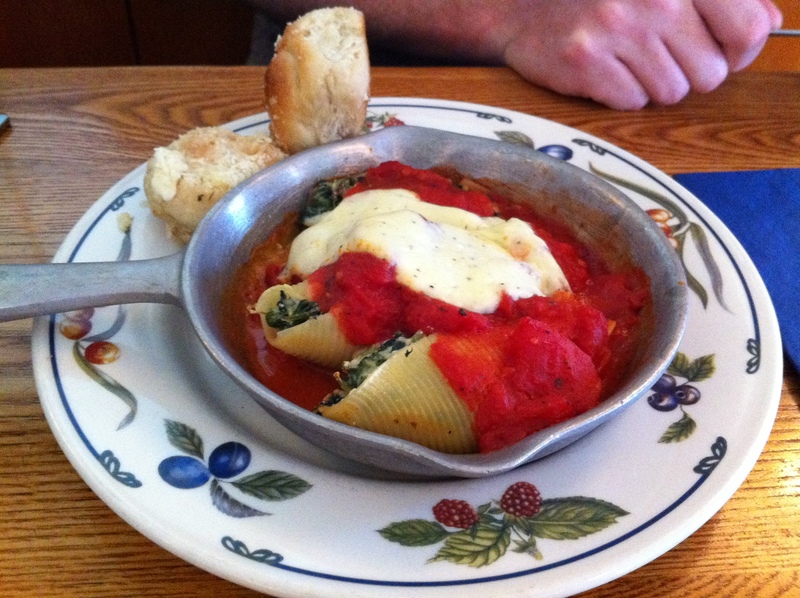 Mark decided on the stuffed shells with spinach covered in homemade marinara. He liked it, and overall it was a solid dish, but the noodles seemed a little dry to me, so it was still missing the mark. Overall, I think The Great Impasta is about the best Italian food I have tried in Maine so far, but I am still looking for a nice, authentic hidden gem somewhere. I would eat here again, but I would try another dish that is for sure. After spending a week in Italy in May I am afraid I will never have real Italian food again. Woe is me. Next stop on my quest for “real” Italian– Paciarino in Portland!